An upbeat article in Time Magazine reports on “what may be one of the few growth industries, in Michigan, home of the nation’s highest unemployment rate: 14%” (“Higher Learning,” Steven Gray, Time Magazine, June 28, 2010). What is Michigan’s exciting growth industry? Medical marijuana. And you can learn everything you ever wanted to know at Michigan’s Med Grow Cannabis College in Southfield. And the prospects are even more exciting in California, if their voters agree on a measure on the November ballot to legalize marijuana for “recreational” use and allow it to be taxed. Tom Ammiano, a Democrat from San Francisco, estimates that those new taxes “could generate up to $2 billion in annual revenue for California.” Hey, how much more can we keep taxing all those poor nicotine addicts and hopeless alcoholics and addicted gamblers? The cities and states have to raise huge amounts of money to pay for their massive debts now, accumulated for years collecting once-lucrative housing property taxes and estate taxes and the hundreds of other taxes to pay for all of their early retirees’ ultra-generous pension plans and A+ health care plans. In the same issue of Time, David Von Drehle writes “Governments that were lavish in the good times, building their budgets on optimism and best-case scenarios, now risk being wrecked like a shantytown in an earthquake” (The Broken States of America: The Other Financial Crisis,” David Von Drehle, Time Magazine, June 28, 2010). 14 states are expected to have less than 1% reserves, “living hand to mouth.” Federal government stimulus dollars (all borrowed, piling up the United States debt to perilous levels) have mostly been spent, most dollars already given to states to keep them from imploding. How do you keep the states and cities and country from falling into deeper and deeper debt? Well, you borrow more “stimulus” dollars from China and other countries that have some cash on hand. You raise taxes on the people and corporations left who can afford to pay. And you find new avenues to fund the plight of addicted spending. You may ask, why not legalize other forms of drugs, to go along with all the chemicals leaching into our bodies from chemical companies and all the billions of dollars of prescription drugs fed to us from our drug pushers, i.e. doctors? Why not allow the free market to supply all of the cocaine, heroin, and methamphetamines, putting profits into the ordinary citizens’ hands and giving governments a huge chunk of new taxes? Legalizing all drugs might help end the flood of Mexican meth warriors moving north across our porous borders. La Familia Michoacana, “a bizarre gang of Christian-fundamentalist narcotraffickers” (“Mexico’s Meth Warriors,” Tim Padgett and Ioan Grillo/Apatzingan, Time Magazine, June 28, 2010), led by Mexican Narario Moreno—a.k.a. El Mas Loco (The Craziest One) is one of the fastest-rising drug cartels, specializing in the production and trafficking of methamphetamine. The Craziest One and his drug “family” produce half of the $20 billion of meth flowing into U.S. streets. La Familia has written its own bible and holds prayer meetings before decapitating the heads of their enemies as they infiltrate the Mexican government, making the American mafia seem quaint and old-fashioned. In TV and movies, making and selling meth seems to be the quickest way to wealth. Who needs the stock market, working day jobs, or education? In TV’s best drama, Breaking Bad, Walter White is a simple school teacher who turns to making meth to help him finance his medical costs after his bout with lung cancer. 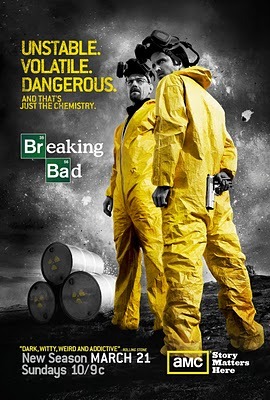 In its 3rd season, White and his partner, former student, Jesse Pinkman, have descended into a hellish storm of betrayals, violent cartel murders, tragic losses, and heart-pounding, near-death experiences, and yet they can’t seem to give up the thrill of making millions by feeding the horrific habits of young American addicts. Even in the highly-praised movie, Winter’s Bone, 17-year-old Ree Dolly has to deal with her vanished father, locally renowned for his skill at cooking methamphetamine as well as the violent drug dealers he was involved with. What’s with all this media preoccupation with drug addiction? You can’t help wondering what would happen if illegal drugs were made legal to reduce the billions in drug trafficking profits and the horrific violence that results. Wonder why these drugs are illegal while all the legal addictions keep feeding our economy? Cigarettes, alcohol, and gambling are joined by the addictions of over-eating huge amounts of fast foods, sugary, salt-loaded and fat-filled food in restaurants and homes that feed eating addictions, contributing to massive amounts of obesity, diabetes, cancer, and heart disease. Think about it: the American economy has been growing for years, fed by the flow of addictions to bigger and bigger houses and TVs, paid for with the addictive accumulation and usage of credit cards. We still get addicted to our latest electronic gadgets, Kindles, iPods, iPhones, WIs, iPads, Droids, and addictions to instant electronic satisfaction on the Internet. Our new 20-year-old part-timer in the warehouse of IDN-Hardware Sales just showed me his new iPhone 4, which he picked up at Wal Mart after standing there from 5:30 a.m., desperate to replace his iPhone which he only bought two months ago. Like an electronic addict, he had to get the “sweet” device which allows him to spend hours scanning the Internet and playing games. Meanwhile, millions are addicted to shopping of all kinds, from clothes to jewelry to other disposable products. And municipal governments, cities, counties, and the entire U.S. Federal Government are so coked-up on borrowing and debt that they can’t relinquish their astronomical spending habits. All of this is enough to make the average person feel like jumping off a roof or stopping at Coldstone Creamery or buying a six-pack. I can’t help but think about Breaking Bad’s Jesse Pinkman at the end of the second season, which I addictively watched (all 12 episodes) after succumbing to the last episode of Season 3. After Jesse’s girl friend vomited to death after getting high on heroin, Jesse fell into a psychologically drug-ridden, comatose state, not wanting to wake up again. Eventually, Jesse returned to life, just like Michigan’s rapper-songwriter Eminem, after being close to death from drug addiction. When all seems hopeless, we can learn something from Eminem on his latest CD, Recovery, which grapples with his years of drug addictions and the realization that “You’re slowly dying. You’re crying out for help.” In the song, “Not Afraid,” he shared how he was able to rise again after a triumphant 12-step breakthrough. Even if the United States addiction to dept increases to almost $14 trillion this year and close to $20 trillion by 2015, making our future far more treacherous than Greece, we can take a little heart from the plight of Eminem. We can wake up one day and realize that selling or using drugs, buying iPhones, constantly using credit cards, and feeding our addictions are all virtually empty and meaningless. It’s scary to think how much of our economy is built on the addictions of millions of Americans. And addictions are not going to get any better by legalizing them. Think how much schools depend on the gambling addictions to lotteries and casinos. Think what would happen to the tax base if the usage of cigarettes and alcohol was cut in half. And then think what the government might do to raise taxes and fees on all of the new “legal marijuana” endeavors. Don’t give junkies more of what they crave. Don’t give alcoholics an open bar. And don’t give government debt junkies more debt.